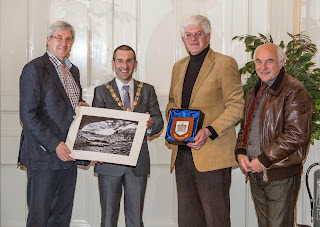 I welcomed Bangor Camera Club to the Town Hall late last month to recognise the valuable contribution made by the club since it was established in 1951. I have previously attended Camera Club events to find out more about the club and launched their exhibition at Bangor Aurora as part of the World Police and Fire Games during August 2013. I was delighted to welcome officers and members from Bangor Camera Club to the Town Hall last week and to able to give them a tour of the historic building. Whether it's through their talks, exhibitions or professional services and advice the club is helped photograph Bangor life and showcase photographic talent to many. I was particularly grateful for the kind gift presented after I gave the club a Borough Plaque to display in their club house. The photo presented is a photo taken by a club member Trevor Craig in a remote part of the USA. After taking the photo Trevor nearly died of heat exhaustion and disorientation when making his way back to his car after capturing such an amazing image. I look forward to promoting the work of Bangor Camera Club as Mayor of North Down and hope to get along to another talk before my term ends.